Update: The pub was bought by English fashion model, racing car driver and television personality, Jodie Kidd in summer 2017. It re-opened late July 2017. 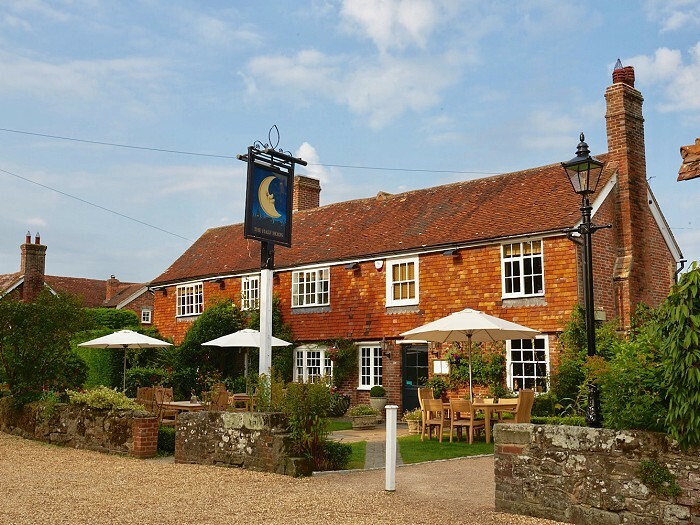 The Half Moon is a picturesque gastropub in a quiet village setting. The cottages (built 1640) that form the pub were once craftsman's workshops for the village. The pub has been refurbished and modernised and still includes a large inglenook fireplace, many old wooden beams and stone floor. Lovely gardens at the front and rear where the pub has herb and vegetable plots. The pub serves local beers including Half Moon Eclipse from Brolly Brewing (just up the road in Wisborough Green). Eclipse was brewed for the pub and has five different malts and three hops, Challenger, East Kent Goldings (EKG) and Sussex. Other ales include, for example, Harvey's Sussex and Long Man Brewery Long Blonde. See also: My review of lunch at the pub, The Half Moon Shines Brightly. Image Copyright: Many thanks to the Half Moon for use of this image. The Foresters Arms is just round the corner.